Posted on Tue, Mar 13, 2012 : 2:42 p.m.
Changes on downtown Ann Arbor's East Liberty Street will continue this year as soon as a new tenant can be found to take over a restaurant that opened less than a year ago. 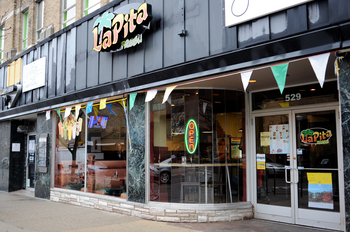 La Pita Fresh, located on East Liberty Street, has been listed for lease. La Pita Fresh, located at 529 E. Liberty, has been listed for lease. The move represents owner Kasey Chammout's disappointment with Ann Arbor's response to his Middle Eastern restaurant. "Students spend their money on beer, pizza, chicken wings, then Chinese and sushi," he said. The restaurant opened in spring 2011, filling the storefront that had been occupied by Beyond Juice. Chammout also operates other restaurants, including a popular La Pita Fresh near Wayne State University. He's been in the industry since 1990. He'll continue to operate the Ann Arbor restaurant until a new tenant can be found to take over the 1,864-square-foot space. The store is not doing badly, he and broker Mike Giraud of Swisher Commercial said. It received positive reviews. "It's just not doing what he wanted in terms of the numbers," Giraud said. Competition among other Middle Eastern restaurants also played a role, Giraud said. Several others operate within a few blocks. The pedestrian traffic on East Liberty is one factor affecting his decision, Chammout said: It's dropped by up to 8,000 per week, he estimated, since the Borders flagship store closed last fall. He's also cited aggressive panhandling as a concern. The change also comes amid multiple shifts in downtown Ann Arbor's restaurant scene, including the closing of Champion House and Parthenon. Chammout said he hopes to return to Ann Arbor with another concept. "I may give it another shot in a few years," he said. "I do like the town." Wed, Mar 14, 2012 : 3:20 p.m. I'm sorry to hear it, but like others have said, there is already good Middle Eastern food elsewhere in the area, and so competition sure is stiff, especially if there are options that offer more variety and atmosphere f or not too much more cost. I will say that after hitting Liberty Street on foot lately, after a looong hiatus due to construction mess and the depressing fact of Border's closing (and no shows at the Michigan I absolutely couldn't miss! ), it feels loads less appealing to me in general. The puke puddle I had to skip around didn't help my desire to come back soon, either. And that it was costing even so slightly more money than it used to for the privilege to park along the puke puddle didn't help much either! And now the one business I'd gone down there to check out, LAB coffee, is closed up as well! Good luck with the Tim Hortons and other chains down there...maybe another student tower leasing office will take the PitaFresh spot and double it up with a dairy queen?! Maybe it can be a late-night one, and serve *both* of the tendency-toward-vomiting populations---the serious drunks and the merely-binging-coed drunks?! Wed, Mar 14, 2012 : 12:29 p.m.
A Chinese buffet restaurant in this spot would be a great success. Cost effective for students and it's a cuisine now served by only one other Chinese restaurant at higher price point. Wed, Mar 14, 2012 : 3:59 p.m. Wed, Mar 14, 2012 : 12:59 p.m. Wed, Mar 14, 2012 : 10:35 a.m.
Everyone on their hobbyhorse about &quot;panhandlers&quot; again. It really is not that big a problem. I'm downtown 5-6 days a week, and get asked for money AT MOST maybe once a month. I either give change or politely ignore the person and that's the end of it. That's so hard for you all...why? This restaurant closing is much more simply explained by the fact that it was obviously inferior in every way to La Marsa and even to the epicly overrated Jerusalem Garden, each about 1 block away in either direction. And the owner's apparent condescending attitude toward his clientele probably didn't help matters. Wed, Mar 14, 2012 : 4:03 p.m.
have to agree with you Rusty. I'm a smaller than average female and I'm downtown every day. I just always politely told the regular panhandlers that I have no cash on me and move along. Now when I seen them, we say hi in passing and they don't bother me for money. Being polite, confident and consistent in not giving money goes a long way. Wed, Mar 14, 2012 : 10:38 a.m.
Oh, and even if one specifically wanted bad ME food, even that was covered within a block already at that place next to Jimmy John's on William. Wed, Mar 14, 2012 : 4:07 a.m. If panhandlers bother you just give yourself a crazy looking face and they usually will leave you alone if they deem you off the rocker a bit. Wed, Mar 14, 2012 : 3:41 a.m. Ya'll need to gt your &quot;Crazy&quot; on. Panhandlers and the like are very reluctant to approach you if look like someone who is not &quot;Joe Mark&quot;. Wed, Mar 14, 2012 : 3:35 a.m.
Bring back Make Waves and State Discount. Wed, Mar 14, 2012 : 1 a.m.
Jerusalem Garden is all I need. Tue, Mar 13, 2012 : 11:18 p.m. There are also Middle Eastern restaurants away from downtown and with easier parking. Tue, Mar 13, 2012 : 10:52 p.m. The panhandling is a problem. I'm a big guy and my daughters still feel uncomfortable walking downtown. They have the death grip on my hands. This was in response to the crutch guy surprising them from an alley asking for money right in their face. There is no doubt that we would not have this problem if we had more cops downtown. Cops walking a beat or police officers on bikes. The DDA should use their never ending parking increases to fund a couple of police officers downtown. Tue, Mar 13, 2012 : 10:21 p.m. Considering that this article is the first I've heard of the restaurant, the owner may have benefited from an increase in his advertising budget. Tue, Mar 13, 2012 : 10:06 p.m.
&quot;Students spend their money on beer, pizza, chicken wings, then Chinese and sushi,&quot; he said.&quot; other than the sushi I could have told him that in 1963 and saved him the trouble. Tue, Mar 13, 2012 : 9:58 p.m.
Tue, Mar 13, 2012 : 9:13 p.m. I have lived in AA my whole life just blocks from downtown and must admit that when I took my baby for a walk downtown last Saturday (a beautiful day with people out everywhere), I was a little intimidated by the cast of characters I encountered walking up Liberty to State St. I would like to see some neutral, affordable stores move in that offer safe, neutral browsing opportunities. Things in the downtown area seem so polarized at this point - not attractive to family-oriented outings. The only kids toy store is in Kerry Town and while nice, is way too expensive to casually peruse. Pair these type of stores with casual restaurants and people might want to come downtown again. Wed, Mar 14, 2012 : 3:37 a.m.
Tue, Mar 13, 2012 : 8:32 p.m. I work very close to this place, and I love Middle Eastern food. The reason I have never eaten there is because Jerusalem Garden is so close by. I love JG and eat there often. I just didn't need another vendor in the same area offering the same food. I would be delighted if another affordable restaurant opened in its place. Tue, Mar 13, 2012 : 8:19 p.m.
Panhandling is a problem, as the owner of this restaurant indicated, whether anyone else wants to admit it or not. It's not that simple to just ignore them. They are in your face and aggressive. It makes walking around commercial areas very unpleasant. Unfortunately, panhandling isn't illegal in A2. I've called police to report panhandlers standing at intersections on busy roads in the area and was told that unless the person is actually IN the road, it is not illegal to stand on the median strip on a 4 lane road, such as the Huron Parkway or Washtenaw Ave, and panhandle at intersections holding cardboard signs. Until the laws change, nothing will change downtown. It's a huge problem and it is affecting downtown walking traffic to shops and stores. If there were more police on foot walking around commercial areas downtown, the panhandlers would start to disappear. A2 has become a haven for these bums from all parts of the county and surrounding areas; many of them are not truly &quot;down and out.&quot; Many are scammers and professionals. Going to the downtown library is like walking a gauntlet of panhandlers who line up outside the building. I don't want to walk in areas where that kind of thing is going on. I live in NW A2, and even outside the Aldi store on Maple there are usually several bums hanging around looking for a handout. Very unpleasant when going in or out of the store. Borders was a draw on Liberty as mentioned in the article, and that's gone now. People used to enjoy walking around the downtown and State Street areas on weekend nights, and that's changed. Wed, Mar 14, 2012 : 12:54 p.m. Wed, Mar 14, 2012 : 12:48 p.m. There is a problem with aggressive panhandlers, but you cannot just outlaw panhandling. Panhandling, alone, is speech protected by the First Amendment (as is holding up signs). Some conduct, such as blocking traffic, interfering with people's passage, etc., can be outlawed. IMHO the biggest problems are the lack of a police presence and the decreased pedestrian traffic in the area due to the Borders closing. Wed, Mar 14, 2012 : 2:29 a.m.
We had one literally block us from closing the door of our car until we gave him money. It was a little scary. It only takes one experience like that to color your perception of the area. Wed, Mar 14, 2012 : 12:14 a.m.
Why are you so bothered by panhandlers at intersections? I've never encountered any panhandlers that were aggressive or bothersome...especially at intersections. They aren't bothering you, or anyone, why would you report them? Who cares? Don't give to them and tell your friends not to...and they will go away! Tue, Mar 13, 2012 : 9:02 p.m. While I don't particularly like the panhandlers, I've never found one to be &quot;in [my] face and aggressive.&quot; Usually, I just politely say &quot;no&quot; rather than ignoring them, and they reply &quot;thanks, anyway&quot; -- or say nothing at all. Tue, Mar 13, 2012 : 8:12 p.m. The point about Pita's is not that it sells mideastern food; the point is that the mideastern food it sells is not good. Tue, Mar 13, 2012 : 8 p.m. I must agree with Suburbia. There are three other restaurants within a few blocks serving almost identical menus and all of them are simply better. It was not bad, but there was nothing special about this place, the atmosphere was somewhat dreary etc. You have to feel for the people who tried to make a go of it, but while things are difficult on E. Liberty without Borders, it all boils down to imagination. Why would anyone open up a restaurant of this type in a saturated market? The success of Mani, just down the street, which has had to deal with the DDA sabotage and is nevertheless thriving should be a lesson--stop thinking about formula places and serve really good, imaginative food and people will come. I hope that whoever takes on the Michigan Book Supply space will not make the same mistake. And no chains, please! They are not only mostly horrible, but they also all look awful and create visual pollution. The 7/11 across the street already makes the area look scuzzy, so that is enough. Tue, Mar 13, 2012 : 7:59 p.m.
Maybe the issue is the business not doing a market study to determine the demand that might exist before opening? &quot;Students spend their money on beer, pizza, chicken wings, then Chinese and sushi,&quot; he said. That would have been something to determine before opening the restaurant, no? I'm assuming he's done a study to figure out why he doesn't have the level of business he wants. Tue, Mar 13, 2012 : 7:50 p.m. I can't think of a large or mid-sized American city whose downtown doesn't have panhandlers. It goes with the territory. What's so hard about ignoring them and walking away? I wish the people who demand the city do something about panhandling would instead demand a more rigorous response to homelessness. The problems that need to be confronted are housing security, substance abuse, and mental illness; not the momentary discomfort you might feel upon being asked for a dollar. Wed, Mar 14, 2012 : 2:26 a.m. Hogwash. I spend a third of my time in New York City, and the rate of panhandler solicitation there is 1/100 that of Ann Arbor's. Tue, Mar 13, 2012 : 11:47 p.m. Rob - The panhandlers are not homeless. Apparently you didn't know this. Some even have jobs. Believe it or not, many people don't like to be run after on the street, which has happened to me many times, by people asking for money. And it does hurt the merchants. People avoid entering if they think they are going to be accosted by a panhandler first. Tue, Mar 13, 2012 : 7:36 p.m.
One thing people don't seem to discuss much is that some restaurants and businesses are better than others. It isn't always panhandling/location/parking. I do like La Pita's food, but for the same price, and cheaper with a coupon, I can get good middle eastern food in a nicer atmosphere on State St. I actually know quite a few students and other members of the university community that like middle eastern food so I don't agree with the owner's assessment that beer and sushi is all people buy. Though those are tasty too. Panhandling does seem to be an issue. I typically get asked 3-4 times for money walking down Liberty. It doesn't prevent me from visiting a business on Liberty though it would be more appealing not be constantly approached and asked. Tue, Mar 13, 2012 : 7:11 p.m. Wed, Mar 14, 2012 : 12:42 p.m.
Tue, Mar 13, 2012 : 7:06 p.m. I am not at all surprised by this. Not having a destination anchor store downtown is leading places to drop like flies around there. Then there is the altogether out numbering of food related storefronts to retail. Pretty soon downtown will be one big food court!. I know many that avoid the blocks of Liberty/State , State/William and pretty much those two blocks all around. This includes Nickels Arcade. Once upon a time this was a pleasant stroll, now it is a guantlet of panhandlers, incense selling dude in your face and people just hanging out doing nothing like birds on a wire. I haven't been able to walk that area in years without several people bumming for money, several times. Tue, Mar 13, 2012 : 6:59 p.m.
Tue, Mar 13, 2012 : 6:58 p.m.
Tue, Mar 13, 2012 : 9:59 p.m.
Technically, the panhandlers are pedestrians, which means the city must make special allowances for them.